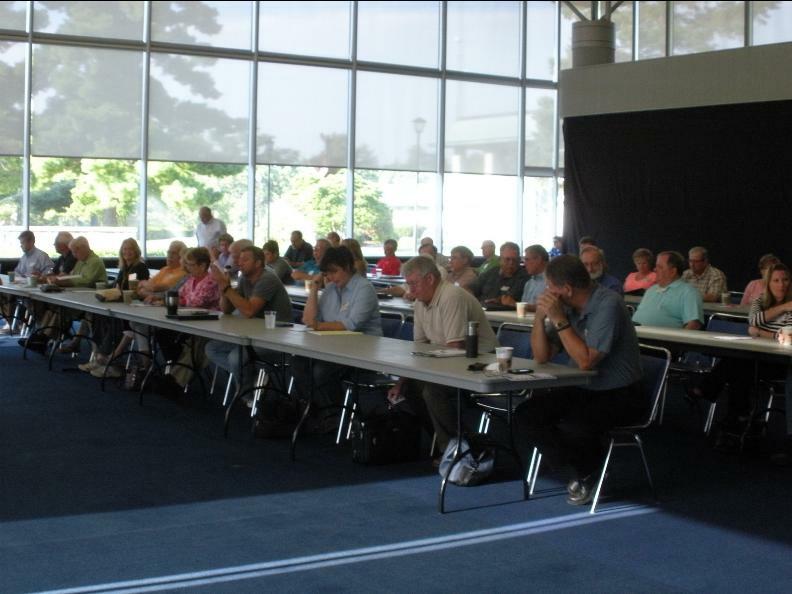 Lewis & Clark Community College, Godfrey, Illinois provided the perfect venue to present ICAPs 2014 Illinois Appraisers Update Seminar. 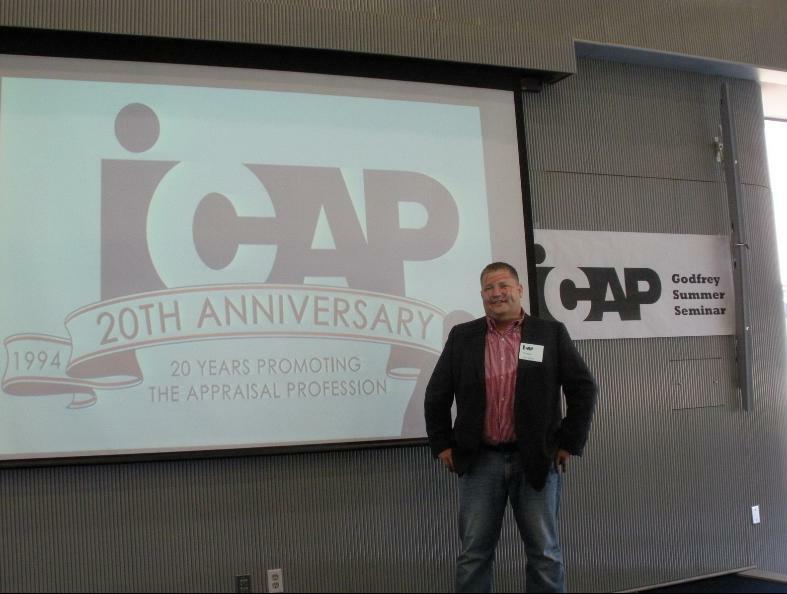 On August 15, 2014, approximately 58 professionals participated, making ICAPs fourth annual Godfrey, Illinois seminar a huge success. Elizabeth Kern, IFSA, our host for the day, opened the session with a warm welcome to participants, thanking them for their support of the Godfrey venue. 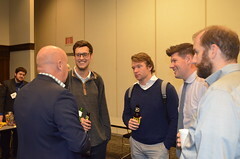 Throughout the day Elizabeth provided brief introductions for the seminar speakers: Tim Dain, John Brenan, Brian Weaver and Mike Orman. 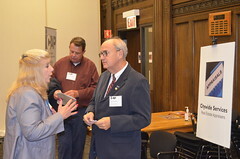 Between speakers, Tamara (Tami) Bellisario, IFA, presented an overview of ICAPs history and purpose. Elizabeth welcomed Stacy Savidge and David Courtney; they were presented an ICAP pin in recognition of their first attendance to an ICAP Godfrey Seminar. All attendees participated in an afternoon drawing conducted by Tami Bellisario, IFA, and Herbert Meyer, ARA, ICAP Director. 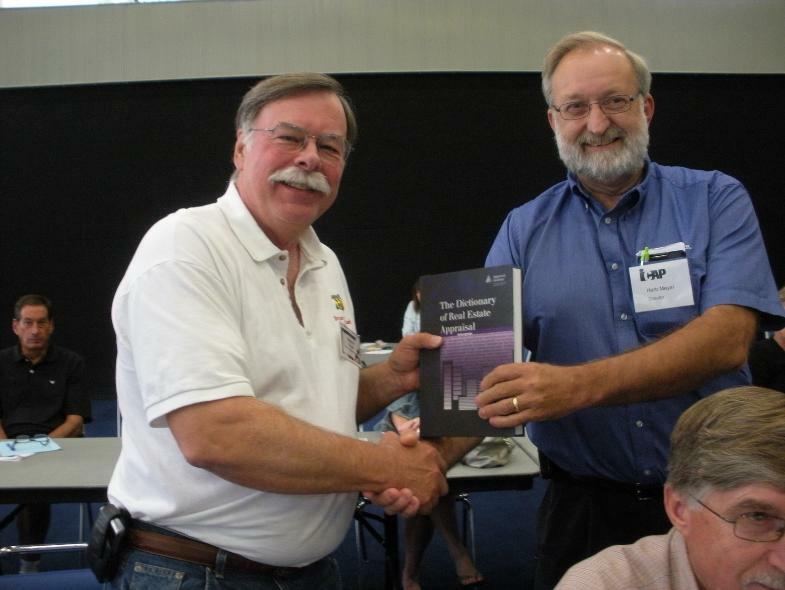 The winner, Steven Brush, received a copy of the Dictionary of Real Estate Appraisal, Fifth Edition, published by the Appraisal Institute. stopped measuring homes. MLS provides appraisers the opportunity to build a custom display and export MLS data into their own appraisal system. Realist mobile is available for android or iphone downloads; an app will be available soon. 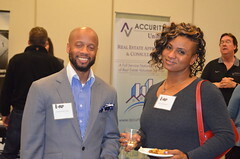 Realtors Property Resourse (RPR, http://www.narrpr.com) is a NAR membership benefit. It provides comprehensive data, analytics and reports. This database will include every property in the US, has built-in appraiser tools, and lets you modify criteria. FIND is a research tool designed exclusively for agents and includes 110 million property records. It is produced by MOVE, Inc. and owned by Realtor. com. Realist, RPR and FIND are all similar products. 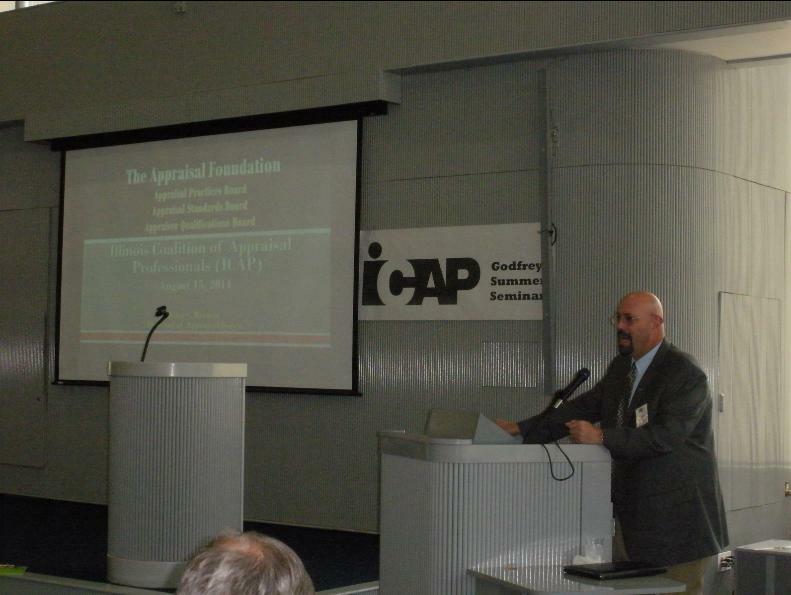 John Brenan, Director of Appraisal Issues for the Appraisal Foundation (AF) since October 2003, provided an Overview of the Appraisal Foundation. The AF is private, not public and provides the appraiser regulatory system in the US whereby the States shall use qualifications and standards established by the AF. It has nine appraisal sponsors, three affiliate sponsors, and one international sponsor. It is comprised of four Boards: The Appraisal Quality Board (AQB), the Appraisal Practices Board (APB), the Appraisal Standards Board (ASB), and the Board of Trustees which has oversight responsibility for the operations of the AF. There are three advisory councils: The Appraisal Foundation Advisory Council (TAFAC), the Industry Advisory Council (IAC), and Valuers Global Forum (VGF). TAFAC is comprised of government agencies and non-profits, IAC is comprised of for-profits, and VGF, formerly called the International Council, is relatively new and speaks about problems and issues in other countries. Congress authorized the AQB to establish minimum education, experience, and examination requirements for qualification to obtain a real estate appraiser credential. AQB has jurisdiction to set minimum qualifications for Certified Residential, Certified General, Licensed Residential, Trainee, and Real Property Supervisory Appraisers. Education requirements, effective in 2015, require a bachelor’s degree or higher; there are no exceptions. All exams are now given by the AQB. Congress authorized the ASB to establish minimum standards (USPAP) for appraisals used in federally related financial transactions. USPAP Rules, Standards and Statements are must dos and binding on the States, while the Advisory Opinions and Q & As are advisory tools. However, an explanation must be provided if a State chooses not to comply with them. 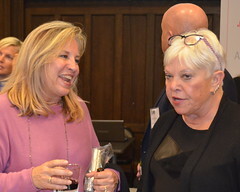 Voluntary guidance for all disciplines in the appraisal profession, including business valuation, on what constitutes recognized methods and techniques is offered through the APB. Projects the APB have been working on include, but are not limited to: Collection and Verification of Residential Sales Data in the Sales Comparison Approach, Collection and Verification of Data used in the Sales Comparison Approach for Non-Residential Properties, Valuation Issues in Separating Tangible and Intangible Assets, Identification of Contributory Assets and Calculation of Economic Rents. For information on any of these topics please visit the AF at info@appraisalfoundation.org. Mr. Brenan can be contacted at john@appraisalfoundation.org. 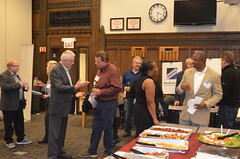 Notable initiatives include the partnership with Association of Appraiser Regulatory Officials (AARO) and the ASC which includes the investigator training courses, a five-year memorandum of understanding with the U.S. Department of Energy on Valuation of Green Buildings, creation of Alliance for Valuation Education, eLibrary and new courses development, creation of webinars, brochures and YouTube videos, and consistent USPAP enforcement. Removing the Statements from USPAP will allow the APB to take on the Statement topics and ask the question, if these are recognized methods and techniques, who is it recognized by? APB intends to look at the existing methods and techniques and develop an abstract for education. There are approximately 85,000 appraisers across the country, approximately 30 or 35 respond to the various exposure drafts issued by the AF Boards. Every comment is read and discussed. It is very important appraisers respond when public comments are requested. Be proactive, not reactive. Board of Trustee members represent a wide range of valuation sectors, banking, real estate, and other arenas. They are responsible for the day to day operations, and financial stability of the AF. Self-supporting through the sales of publications and courses, registry fees now represent less than 5% of the 2014 revenue. Lunch was at large with many partaking of the college cafeteria’s diverse menu and outdoor veranda dining. A sunny and beautiful day, the veranda overlooks the campus grounds and architecturally attractive buildings. The Godfrey campus is located on the 215-acre grounds of the former Monticello College, a small, private liberal arts college for women founded in 1838. The beautiful campus features sculptures and fountains, and includes a garden site of the Missouri Botanical Gardens. 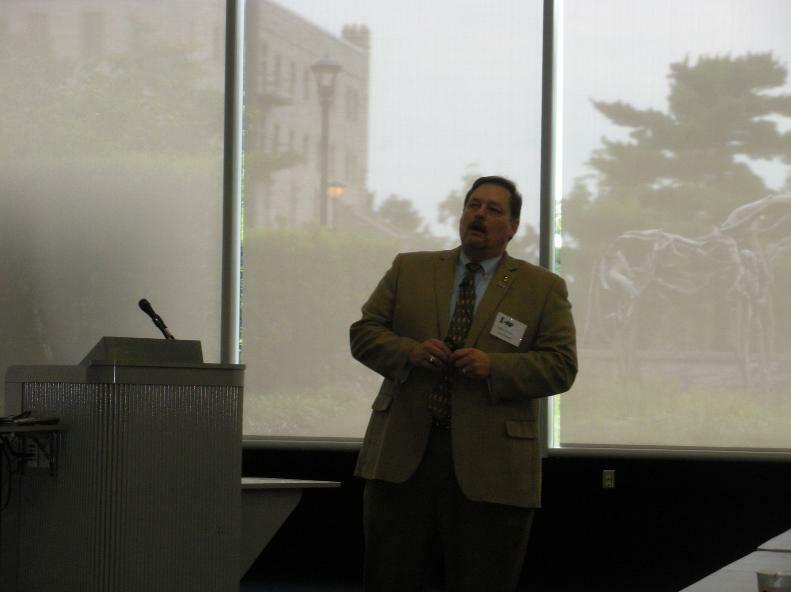 Brian Weaver, Illinois Coordinator, presented Legislative Updates. During 2014 the Division of Real Estate was created, SB3044 passed, criminal background checks begin January 2015, and there were member changes to the Appraisal Advisory Board. The Illinois Governor signed an Executive Order on March 31, 2014 creating the Division of Real Estate resulting in a structural change and creating a Director of Real Estate. The Appraiser Act was amended through SB3044 to comply with the AQB criteria. Effective January 1, 2015, background checks for new licensees will be required. Other changes included in SB3044 pertain to BPOs and waiver valuations. 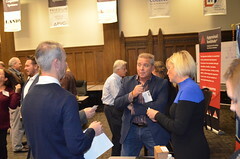 The newest member appointed to the Illinois Appraisal Advisory Board is Peter Poulos, MAI. Retiring from the Board is Timothy J McCarthy, SRA, IFA. There are 4,427 Illinois appraisers: 515 Trainees (94% in IL), 2,452 Certified Residential (91% in IL), and 1,460 Certified General (73% in IL). Since August 2013, approximately a dozen licensed AMCs have closed. Brian anticipates, while the larger AMCs will remain active, there will be more AMCs leaving the business. As a reminder, by law, the AMC payment schedule must be definitive: 30 days, 45 days, not 30 to 45 days. Brian highlighted areas of deficiency in appraisal reports and provided helpful suggestions to correct or improve the way in which appraisers communicate. Areas discussed included generic or bland descriptions. While local clients may know the area described as “the loop” refers to Downtown Chicago, a Texas reviewer may very well be asking, “What is a loop”? Could your neighborhood description fit both St. Louis and/or Wilmette? While the description may be meaningful to you, the secondary market may not know what you are talking about. Dimension, area and zoning: If unable to obtain the appropriate information, then describe why in the narrative. When there is no zoning, it is okay to say so. Brian asked, “does the scale of your sketch require a microscope to see it”? Does your report use generic language which tells the reader nothing? Cost approach and site value statement issues, such as: site value derived from local area from sales with similar size, or site value based on prior knowledge of local market. The certification states, I researched, verified, analyzed and reported…. How are you responding to the statement, I did or did not analyze the contract? How does appraiser viewed copy of sales contract and it is retained in appraiser’s work file comply with the certification? Are you in compliance with law? It is not necessary to include the person’s name who ordered the appraisal; Section 225ILCS 458/10-15 has been repealed. Reporting a fee is only necessary when engaged by an AMC; Illinois Appraisal Rules Section 1455.250; Illinois AMC Act 225 ILCS 459/15. The USPAP Ethics Rule required prior assignment statement needs to be included and must disclose ALL services previously performed. While USPAP allows an appraiser to gain knowledge, FNMA Certification #11 does not. USPAP Statement 8 was retired in 2002. Certification #24 addresses electronic signatures. What does your certification say? It is not necessary to repeat language already included in the certification, such as appraiser independence or no conflict of interest statements. Repair Observations and the Home Inspection Act: The language in the Home Inspection Act is problematic and has been for numerous years. Brian is looking into fixing the language. In the URAR form, Limiting Conditions and Assumptions Certification #5 addresses needed repairs. Observed definition means to state the facts; do not judge it, just state facts. Some examples would be: Garage windows show evidence of cracked, blistered and peeling paint. GFI outlets were not located within the kitchen or bath. Crawl space height clearance was less than 18 inches. Brian reminded us to be aware of pitfalls which mix old Limiting Conditions with new Limiting Conditions, redundant and repetitive language, caveat overkill, ancient caveats, and previous statement contradictions. Limiting Conditions and Certifications are about what was done. They should be providing clients the how and why of what you did. Brian asked, If you don’t have the time to do it right, when do you have the time to do it over? Licensing questions should be addressed to Mary Bates. Her Springfield contact information is 217-785-9643 or email her at mary.bates@illinois.gov. Anything else, or to contact Brian, email him at brian.weaver@illinois.gov. 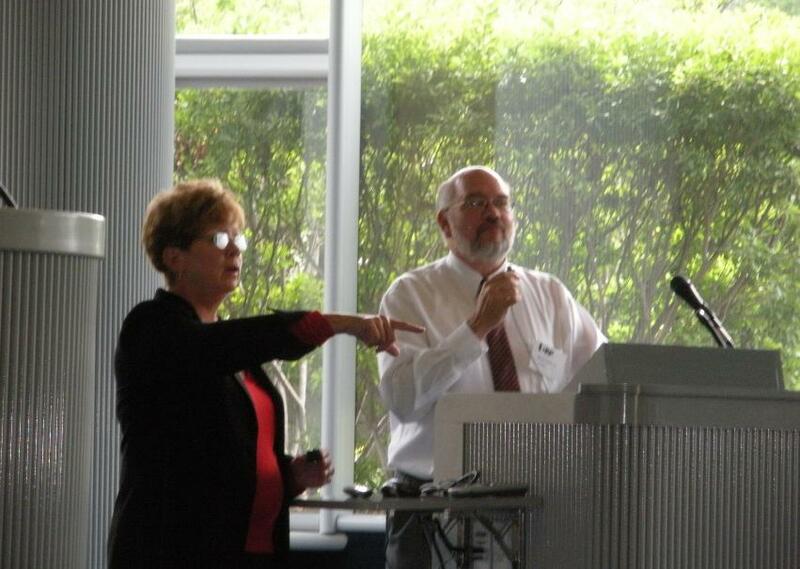 Mike Orman, IFAS, ASA addressed the 10 Biggest Mistakes that get Appraisers in Trouble. 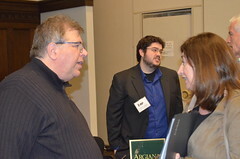 Posing questions for thought, Mike suggested the attendees think about, “What role do appraisers play”? What do appraisers bring to the table? How do I know what my value as an appraiser is? Mike’s homework assignment was to encourage each appraiser in attendance during the next two weeks, to log every assignment. Keep a record of all the time you work on the assignment including the time you do revisions. A log kept should start from the first contact to when the assignment is ended. Then, compare the result of your logs to your gross billings. What will you find? Occupancy is reported incorrectly, (7%). Income approach is not presented adequately and/or the conclusions are not supported, (14%). Extraordinary assumptions and/or hypothetical conditions are not identified and discussion of their effect on value is not discussed, (19%). Lack of or inadequate work files, (25%). Do your work files have a true copy of the report and a signed certification? How do you handle your revisions? The work file should contain both reports. Relevant characteristics of the improvements are not adequately identified, disclosed or discussed in the report, (26%). Inadequate explanation as to why an approach to value was excluded, (35%). Incorrect reporting and analysis of the subject site, (39%). Improper analysis of the neighborhood and area market conditions, trends, and factors affecting marketability, (42%). Inconsistent data and unsupported conclusion in the cost approach, (46%). Quality and quantity of data is not addressed in the reconciliation, and conclusions are not presented in an appropriate manner, (61%). Current or previous listing information, and previous sale or transfers of the subject are not provided or analyzed, (67%). Site value is not supported, (63%). Sales are not properly verified or analyzed, adjustments are not supported, and clear analysis or conclusions are not presented, (82%). Mike reminded us that perfection is impossible to obtain, to include some data in your work file that supports your adjustments, and as appraisers we can have differing opinions and we both can be right. Many thanks go to Tim, John, Brian, and Mike for providing us with their expertise and a great education experience. 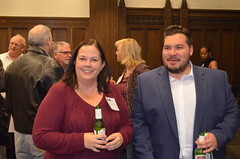 ICAP wishes to recognize Elizabeth Kern, IFSA, and Tamara (Tami) Bellisario, IFA for the many volunteer hours spent in arranging all the details of ICAPs Godfrey Seminar including the venue, the speaker line-up, the hotel accommodations, and hosting the seminar. Just down the road, (about a 10 minute drive in rush hour) on Homer M Adams Parkway, out of town attendees had accommodations at the Lewis and Clark Holiday Inn in Alton, IL. The facilities include an indoor pool, whirlpool, exercise facility, business center, restaurant, bar, and atrium. A buffet breakfast is included with each morning of your stay. Thank you, Elizabeth and Tami. 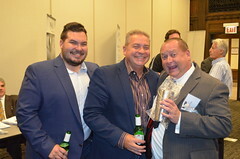 Last, but not least, ICAP extends a heartfelt and special thank you to all the 58 professionals who attended the Godfrey seminar. 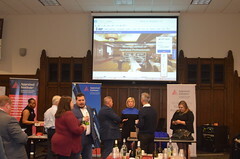 The success of the Godfrey location seminar is directly related to your participation which supports ICAPs ability to offer this educational opportunity for our downstate fellow professional appraisers. For those unfamiliar with the area, I encourage a road trip planned around the next ICAP Godfrey seminar. Hope to see you there next year! Adding your voice to ICAP has never been easier or more affordable. Join Today !